The Aqua Cutter 710 robots provide the most versatile hydrodemolition systems on the market, with configurations suitable for many operations such as horizontal, vertical and on over-head work. Theunique 3-D positioning of the 710V front power head gives the operator full freedom to efficiently reach all areas. 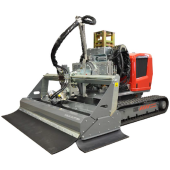 The710 is also suited for work in tight areas due to the compact and maneuverable design.